The Party of Regions' "second set of books" made available to the National Anticorruption Bureau (NABU) by the party's former deputy head, Viktor Trepak, covers the years 2008-2012, NABU chief Artem Sytnyk has said. "Viktor Trepak handed us the pages of the expenditure log similar to what Ukrayinska Pravda published on 31 May. These pages were filled by hand. They mention the dates, surnames and initials, the sums allocated and the brief description of expenditures. Overall, the NABU received 841 pages covering the period from 2008 to 2012. Every page has around 30 entries. Overall, according to preliminary estimates, the files contain around 25,000 lines. The sums mentioned in the lines vary. There are five dollars and there are millions. 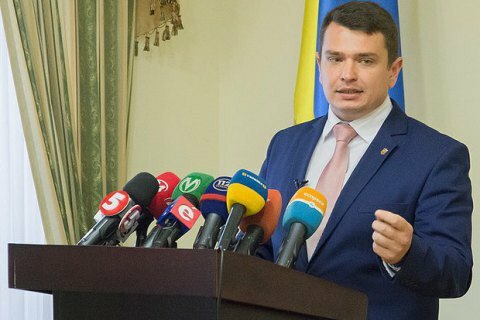 The NABU has not received any other documents either from Viktor Trepak or anyone else," he said. The pages have been scanned and are now being examined by NABU detectives. "The biggest sums" will be subjected to investigation, he added. The bureau is not planning to publish all the pages for the interests of investigations. On 28 May, Trepak provided the NABU with the documents confirming illegal payments by the Party of Regions to former and current high-ranking officials. In his words, this is the so-called "second set of books" of the Party of Regions which documented a total of around 2bn dollars in bribes.